!!! Merry Christmas & Happy New Year !!! 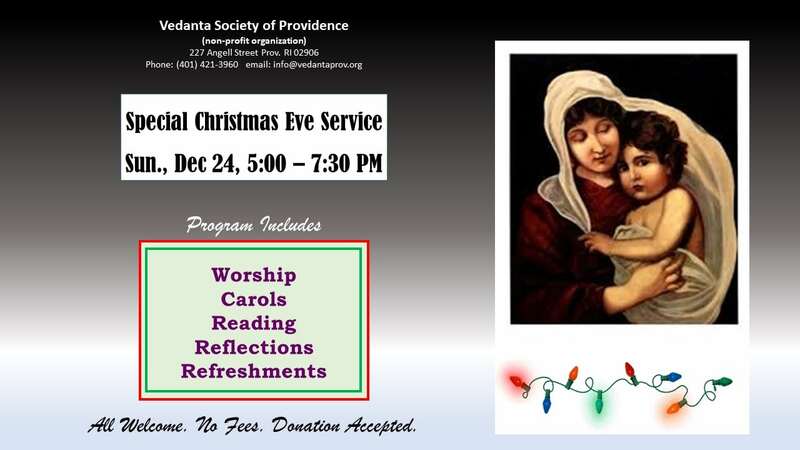 Short worship to Jesus; Christmas Carol singing; readings related to Christmas Eve and the formation of the Ramakrishna Order; reflections; and refreshments offered. All are welcome. The birth anniversary of Swami Saradananda, a direct disciple of Sri Ramakrishna, will be observed in the morning with a chant, and in the evening with a short biography reading (during the Christmas Eve program). Swami conducted a retreat at the Vedanta Center, Atlanta GA, with two sessions of two-and-a half hour to about twenty-seven devotees on Sat Dec 16. He also delivered the Sunday Service to about thirty devotees. Swami then traveled to Augusta Hindu Temple on Sunday Dec 17 where he spoke at the Hindu Temple to over fifty devotees. Swami returned to Prov. on Monday Dec. 18. Swami spoke on basic Hinduism/Vedanta in four H.S. Religion classes of about twenty-seven students each from 8 am – 12noon at LaSalle Academy in Prov. RI. The birth anniversary of Swami Shivananda, a direct disciple of Sri Ramakrishna, was observed in the morning with a chant and in the evening with a song and a short biography reading. Five devotees participated in the monthly day-long meditation, which began at 12 noon after the 11am – 12noon guided meditation & singing. During the last class, we saw that the human personality is comprised of a gross body, subtle body, and the soul. Although the gross body dies quickly, the subtle body survives, moving from gross body to gross body, so long as ignorance survives. As human beings, there are three modes by which we acquire knowledge: instinct, reason and intuition. What we call instinct was at first a deliberate action done through thinking and then gradually became a habit and, in turn, an instinct. The same idea applies to evolution: whatever action we perform gets into our nature and we evolve accordingly. What we do not need becomes an unnecessary burden, and we discard it. While environmental factors, or nurture, explain individual variety to an extent, there is a deeper cause. What is this deeper cause? Heredity is the idea that individuals receive traits from their parents through genetic transmission; however, the theory of heredity does not comprehensively explain the cause of individual variety. According to the theory of reincarnation, parents do not beget children; children beget parents according to the environment they desire. The deeper cause of the individual variety we see is to a large extent determined by the transmission of information—not of matter—at the mental level. If we have certain traits we want to manifest, we need to obtain the proper material for its manifestation. For spiritual growth, the theory of reincarnation makes us take the whole responsibility of our spiritual evolution on our own shoulders. We are the makers of our destiny. Aspects of intelligence include cognition, knowledge, and our response to a situation. Everyone was aware that apples fall, but Isaac Newton had a different response, and so discovered the law of gravity. Humans feel that there is an ‘I’ that is separate from the world. We want to be happy, to have control, to be loved, and to expand our knowledge infinitely. Alan Turing was a visionary, who asked: Can machines think? The Turing test is whether a machine can fool us into thinking it is human. Computers have beaten chess champions and won Jeopardy matches, and there is a robot that engages in conversation. A computer can process an entire library in a minute, whereas humans can only think of a few things at a time. Artificial intelligence, or AI, is an extension of human intelligence. Is there an end to the eternal quest for knowledge, happiness, and love? The sages of the Upanishads ask: Can we know that, knowing which everything becomes known? Is there a basic unity? Death and loss make us ask: What is the ’I’ that we are so obsessed with? Ramana Maharshi experienced himself as being dead, and lost all interest in the external world. His only teaching was asking: Who am I? Yajnavaklya told King Janaka that if all other lights went out, the only light that would remain is the light of the Self, which is self-effulgent. Knowledge of the Self comes from the experience of the sages. We can all attain this experience, by purifying and disciplining our senses through Yoga. Animals are impulsive by nature, they respond to their natural instincts. Humans, on the other hand, have the ability to discriminate and determine how to respond to a natural impulse. However, not too many people are able to withstand external impulses and fall prey to them. Girish was such a devotee of Sri Ramakrishna. He got entangled in many bad habits. But, he had a key strength that he was sincere and never stopped reasoning. He came to Sri Ramakrishna and asked him what he should do from where he stood (which he knew wasn’t a very good place). Sri Ramakrishna told him some simple practices. But Girish could not commit to any of these things due to complete lack of routine and discipline in his life and his utter sincerity towards Sri Ramakrishna (in that he didn’t want to give him a word and then not keep it). Finally, Sri Ramakrishna asked Girish to give Him the power of attorney. Girish thought that he was absolved of all the compulsions. But because of faith and sincerity, his heart was filled with tremendous love for Sri Ramakrishna. He said later in his life that the power of attorney made him think of God every moment of his life – it wasn’t limited to a few hours of meditation or spiritual practices. By taking the power of attorney Sri Ramakrishna took complete responsibility for Girish’s spiritual welfare. He also took on Himself the burden of his karmas. Only the incarnations of God have the ability to take evil karmas of others upon themselves. Sri Ramakrishna once saw in a vision that his subtle body had developed sores in the throat area – He said that he had developed His throat cancer because of taking on the karmas of his devotees. Sri Ramakrishna also said that past incarnations lose their efficacy and every era gets new incarnations that have efficacy for that era. All human beings are presented the choice between Shreyas (what is good) and Preyas (what is pleasant). Intelligent people shun what is pleasant fully realizing the suffering that comes from them in the future and go after the good. It is in making this choice that there is a difference between human beings. Struggling with making this choice, we seek to find compromise between worldly pleasures and divine bliss. That is not possible. We search for religion that provides such a compromise. Such religions attract a lot of people. Those who teach the religion of no compromise do not get a lot of people because people do not like it. In trying to find this compromise, we get cheated. We must realize that every pleasure comes with a prick of conscience. This prick stays long after the pleasure is gone. Hence the key question that we must address before seeking any pleasure is: Do I want to go after that again (the pleasure that caused me suffering in the past)? This choice is entirely ours and no one else is to blame for the choices that we make and consequences that we suffer.